Corazon volunteer Cindy Stephen attended our November 18th meeting to collect dozens of bags of goodies headed to Mexico and holiday parties to be thrown by Corazon in several small villages. Rotarians donated toys for 6 year old boys and teenage boys, as well as gifts for men and women. The kids will receive smaller items since their houses are so small and they have no storage. Women really appreciate comfort items such as blankets, gloves or scarves to keep warm. They also like household items such as dish towels or cooking utensils. Men will be receiving inexpensive tool sets at Big Lots and other useful items. Orange Sunrise partners with Corazon’ each year to build homes in the Tijuana area. For more about Corazon, visit Corazon.org. Rotarians join Corazon volunteer Cindy Stephen, to provide gifts for impoverished villages in Mexico. 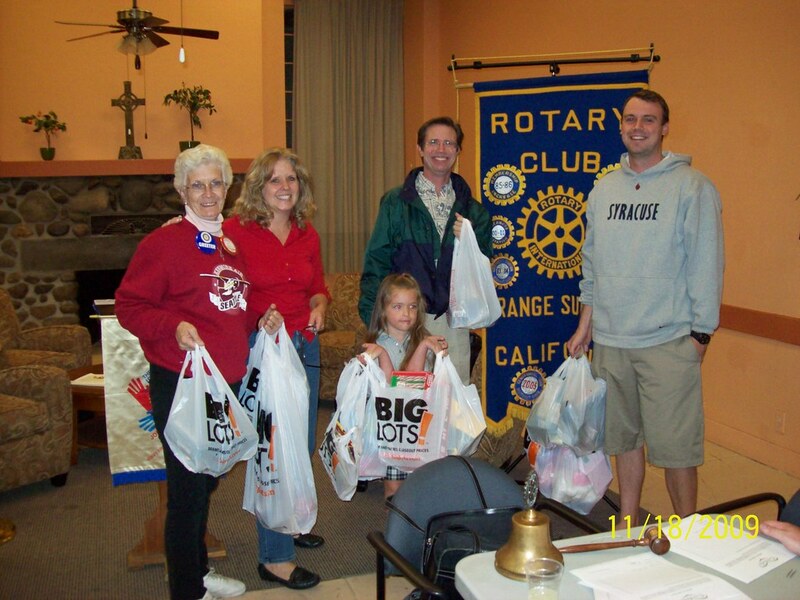 Pictured from left: Rotarian Sue Hayes, Cindy Stephen, Samantha Marikian, Rotarians Tim Hufler and Kevin Hogan. This entry was posted in International Service, Vocational Service, Youth Service on November 18, 2009 by Rae.